Curved li-po batteries are a specialty that we have developed with GMB Battery. 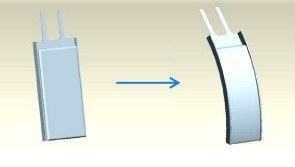 We have developed custom equipment to manufacture curved cells. The maximum thickness of a curved cell is about 2 mm, though 2.5mm cells can be curved if the radius is large enough. Most of these cells are custom made, but we do try to stock sizes that can be used for evalution and prototyping, or even for designing into your product. We also stock thin cells that can be bent by you. 3. Similar in all other ways to standard lithium polymer cells. Note on safety boards: The PCB or "protection circuit board" is optional, and only included when requested. Some of our in-stock cells have the PCB installed. The PCB prevents the cell from being over-discharged, short circuited, or exposed to a charging voltage that is dangerous. A typical PCB data sheet is shown here. An MSDS for lithium polymer cells is here. The cells that have "add to cart" are in stock for sample quantities. We try to keep 5 to 500 pieces in stock of these cells. Larger quantity and unstocked items need to be ordered from the factory in China and can take 3-6 weeks to arrive. Most customers need custom cells. The maximum dimensions are width 30 mm and length 80mm. For a single cell the maximum thickness is 2.3mm, but they can be stacked to form thicker cells. Custom runs involve tooling charge and minimum order quantities, which are typically 2000-3000 pieces. PGEB01180270 No longer available, sorry. The GM201021-R showing how it is curved. (1) Do not short-circuit and do not overcharge lithium ion polymer cells. (2) Do not over-discharge , dent, crush, or burn the lithium polymer cells. (3) The lithium polymer battery should be charged in a safe manner, and never overcharged or overdischarged. (4) Do not try to solder directly to lithium polymer batteries . (5) Do not disassemble lithium polymer batteries.